The Crowned Heads 729 Calloway Ln. Hey, here I am! My apologies to Tony and Jeremy for my extended absence due to a number of reasons, not the least of which is the longest stretch of crappy outdoor smoking weather that I can remember in these parts. There seems to be little let-up in the foreseeable future, too, so while we actually have a short sunny break, I’m going to get in a review that I have been meaning to do for about five months. Last year Cigar Federation teamed up with Crowned Heads to produce a limited edition cigar to celebrate the birthday of the daughter of Cigar Federation’s owner Logan Lawler. 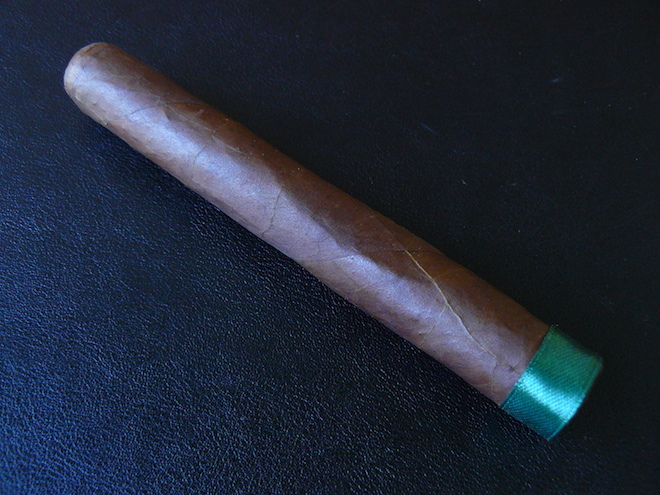 Production was carried out by Ernesto Perez-Carrillo’s Tabacalera La Alianza S.A. factory. Only 200 boxes of 10 cigars were made in a single 6 x 52 size, and sold through the Cigar Federation store. Predictably, they quickly sold out, but fortunately for me, my good friend Chris Tivnan, aka Louisville Chris, was one of the ones who got in on them and sent me a couple. Big thanks to Chris for giving me the chance to try them out! The presentation of the 729 Calloway Ln. couldn’t be much simpler without being completely naked. A single band of green ribbon on the foot is all there is, and that’s fine by me. 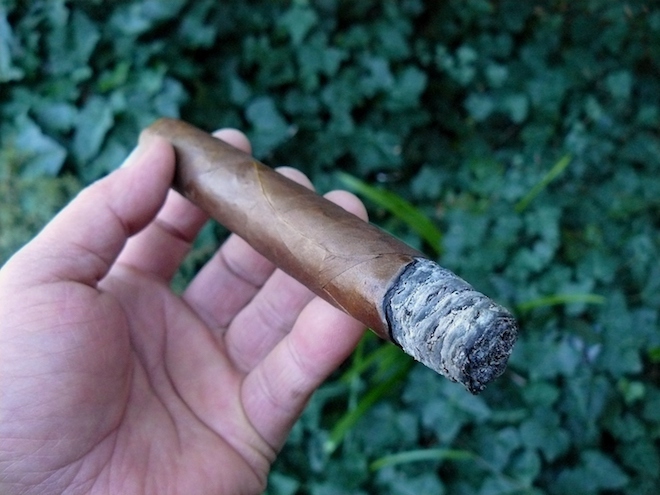 The cigar itself is wrapped in a medium brown leaf that shows a few small to medium veins, a bit of tooth, and a slightly lumpy roll. The pack is very firm, with the exception of a soft spot near the cap. Sniffing the wrapper brings forth not much more than a bit of earthy tobacco, while the foot shows more of the same with an added mustiness. A slightly snug draw reveals cedar and sweet spices. The first draws of the 729 Calloway Ln. 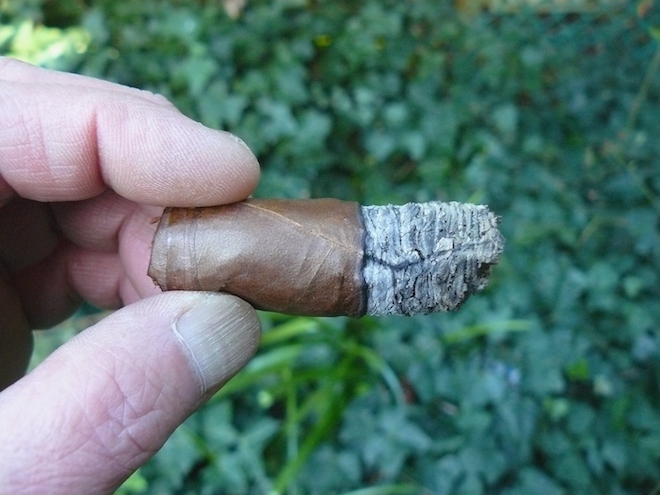 show natural tobacco, sweet cedar, light spice, and pepper. A nice medium pepper is prominent on the retrohale, but soon fades back. The draw has opened up to a perfect level of resistance for me, as floral notes move in. What started out as a rather thick burn line is thinning out as the Calloway burns mostly even, leaving behind a compact medium gray ash that hangs on for over an inch. Near the close of the opening third, the pepper makes a strong return on the retrohale. The middle section of the Calloway brings in vague fruitiness as the wood has receded along with the pepper, leaving an oily mouthfeel. Sweet, tart citrus joins in, nicely complementing the natural tobacco, floral and spice elements, and what’s left of the cedar. The burn had wandered a bit, but has almost completely self-corrected. The sweetness level has dropped down and some earthiness has crept in. While a certain amount of brightness remains in the flavors, they have definitely taken a turn toward the darker (though not evil) side. The earthiness climbs in small increments while being balanced by the now semi-sweet spice notes. The 729 Calloway Ln. smokes absolutely cool down to the nub, leaving just a slight nicotine hit, and that previously mentioned depression near the cap even made for a handy thumb-rest. I really enjoyed the heck out of the two Calloway Ln. sticks that I smoked for this review, so if you’re one of the people who jumped on it when it was available, you are lucky (or smart). 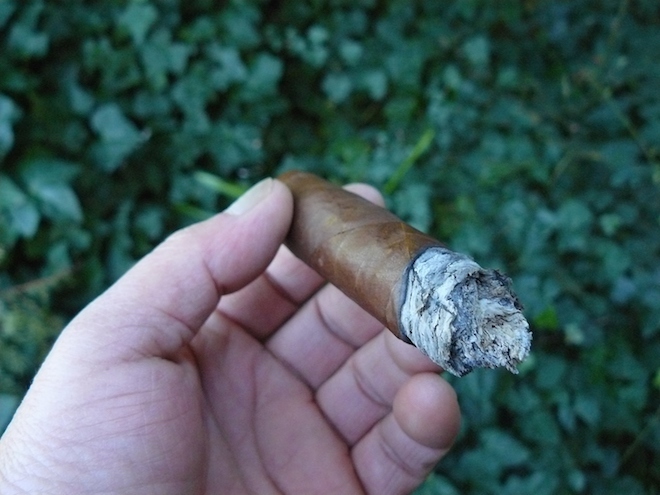 The flavors of the cigar mixed very nicely with each other and showed a decent amount of complexity, while construction and burn were excellent, with nary a thought given to touch-ups or re-lights. I wouldn’t hang on to them for too long, though, because I’m not certain that those sweet spice and fruit notes will last under extended aging. I regret not getting on these, but truly am grateful that I did get a chance to try them out. The 729 Calloway Ln. is indeed a very nice tribute from Mr. Lawler to his daughter. Lil Opal by Firestone Walker is a blend of French and American barrel-aged saisons that have been put through a second barrel fermentation. I would like to tell you more about it, but this is one of those beers that is normally out of my reach price-wise, and only came to me as part of a generous Christmas package from my brother. Man, I feel like a real weasel having been gifted both the cigar and beer for this review! Anyway, despite not knowing exactly how the beer tastes, after smoking the first Calloway Ln., I felt comfortable matching it up with the Lil Opal, and it turns out I was right. This beer has a light, bright mouthfeel with a tart and sour hit. Flavors of apple and lemon with just a bit of funk, lead to a long finish, making for a great match for the 729 Calloway Ln. Those elements helped to bring out more of the sweetness, spice and fruit that the cigar carries, and balanced things out beautifully. A Belgian pale ale or a fruity Weissbier would also be a great pairing. 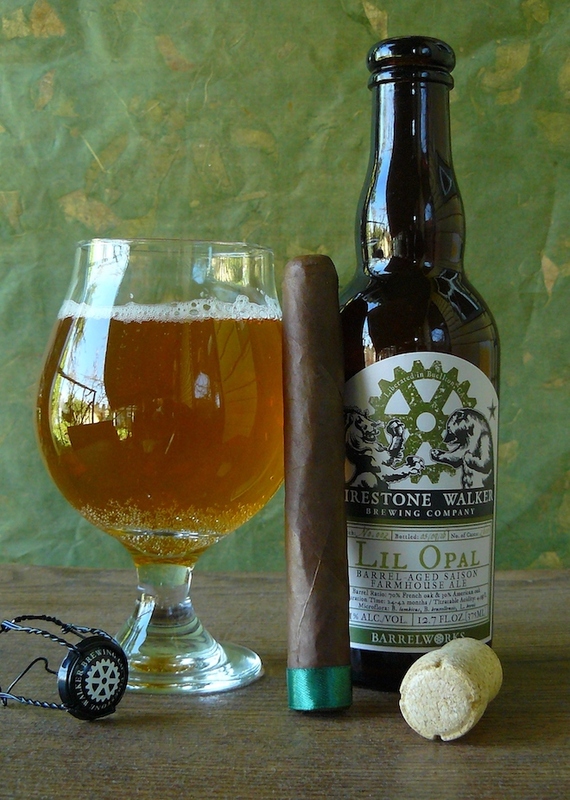 Related ItemsBeer and Cigarbeer pairingBeer ReviewCigar Federatoncigar pairingcigar reviewErnesto Perez-CarrilloFirestone Walkerjon huberlil opalTabacalera La Alianza S.A.The Crowned Heads 729 Calloway Ln. It’s a great cigar! Glad you enjoyed them. I sure did! Thanks again, brother! I was fortunate enough to be able to buy a box initially. When I smoked a couple I knew I had to have more and pleaded with Logan for another,box which he gracious supplied. There is not much danger in them aging in that I can’t stop smoking them. Ha! If they were a regular production they would make my top cigars of 2016 and I would gladly be pulling out my $ for regular box purchases. Such a tasty medium cigar. Haha, I know what you mean, Arless. Thanks for stopping by!